Tower Trail Run 2017 | JustRunLah! Beginning at the newly-renovated hospital laundry building on the edge of The Valley Lakes, the course winds it’s way past Mount Gambier’s iconic Centenary Tower. Passing by the Blue Lake, visiting Leg Of Mutton Lake, and taking in the bluegum trails, this course has you circling the crater of one dormant volcano and running into, and through, another. 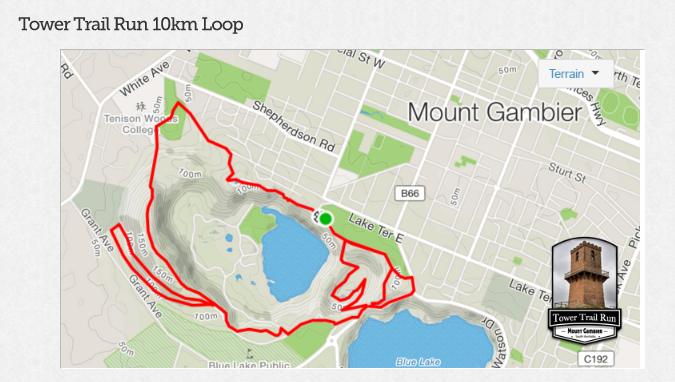 It’s a scenic course offering either 10.5km, 21km, or 42km of trails via your choice of one, two, or four loops. The course does include a variety of hills, stairs, rough terrain and amazing views.